Dragonflys like to sit on the highest perch around. I saw one on my rosebush so I held my finger out in front of him about a foot away. I kind of shooed him off the bush and he flew up and landed on my finger. He must have stayed there about 5 minutes. I was able to get my cellphone out and take a few photos of him. Related ~ Bird Whispering and Bunny Whispering. Huh. Why would they do that? Seems like it exposes themselves to predators, no? 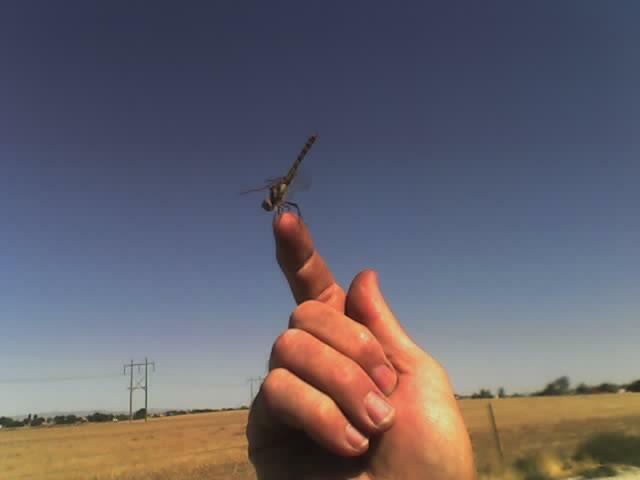 I'd like to try it sometime too - though I'm not likely to encounter many dragonflies around here. That is impressive .. but my wife shudders at the thought. Hey Enas, you live in Vegas. There are lots of Dragonflys there.